Penrod, a cloud consulting agency specializing in business improvement initiatives, has announced that it will open its newest of four offices in Dallas, Texas, as part of a national growth strategy for 2017. "Its important for us not to just want to do business in Texas, but be a part of Texas and everything it has to offer." In 2016, Penrod became Salesforce's second-fastest growing national partner and named #6 Top Wisconsin Companies according to Inc. Magazine. In 2017 Penrod achieved Gold Level Partner status with Salesforce. Penrod’s focus on improving processes and managing change continues to ensure company-wide success and return on investment for its national clients and partners. That trust, combined with a 9.9/10 customer satisfaction rate, has afforded Penrod the opportunity to open three new offices in the last year in Chicago, Minneapolis, and a new headquarters in Milwaukee. When we look to expand Penrod, we look for communities and areas that have the same core values as Penrod does. While most people are looking to the coast, we found the people of Texas, and Dallas in particular, to align with our already growing teams, where being helpful to our clients, community and coworkers is the core value we seek. "Penrod is looking forward to working with companies in Texas as they grow, being a growth company ourselves we know we can help companies in Texas get where they want to be using the tools Salesforce.com offers. Its important for us not to just want to do business in Texas, but be a part of Texas and everything it has to offer." The new office is in The Centrum building, an iconic Oak Lawn office and retail building located at 3102 Oak Lawn Avenue, Suite 475, Dallas, Texas 75219. 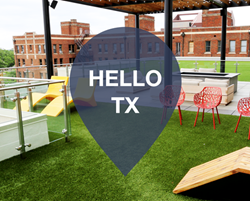 The location features a 15,000 square foot community courtyard, the largest roof top deck in Uptown, a fitness center and a wide selection of restaurants; both on site and within walking distance. As a Salesforce.com Gold Partner, Penrod works with many verticals to customize and implement Sales Cloud, Service Cloud, CPQ, Community Cloud, Field Service Cloud and more. Trusted as a premier provider of data management solutions, Penrod has made a name throughout many industries with extensive experience in Health and Life Science, Manufacturing and Professional Services. Penrod helps give a 360-degree view of their customers, reach further growth and development and create customer success. To learn more, visit http://www.penrod.co.